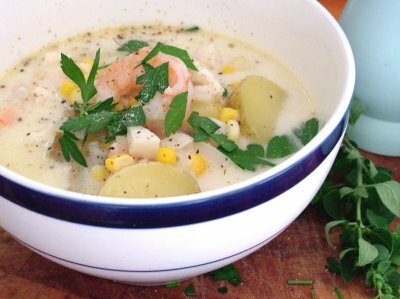 Our field chef, Doug, has released his famous recipe for seafood chowder! I promise it is one of the best chowders you will ever taste. This recipe was voted as one of the top ten chowders of Vancouver Chefs in the “Ocean Wise Chowder – Chow Down” at the Vancouver Aquarium. Make sure to buy organic local produce & seafood from sustainable fishing practices to make it extra tasty. Cook stirring often, in a large soup pot over medium low heat until beginning to crisp, 10 – 15 minutes. Add & cook, stirring until soft & tender, 10 – 15 minutes. Directions: 1) Toss all ingredients together until evenly coated and then pour out into a baking pan. I use a large roasting pan, as it keeps everything contained. A cookie sheet with a lip also works, but you will have to stir more carefully. 2) Bake at 300 degrees for 30 minutes, turning it with a spatula every ten minutes or so. The granola is finished when it is an even golden brown. Note: You can store this granola for approximately 1 week. This is a great breakfast or snack option. Just add yogurt and fruit. Ingredients: 1 avocado (mashed), 1 tomato (chopped), ½ red onion (chopped), Sea salt and pepper (to taste), Juice of ¼ lemon. Mix all ingredients together and eat with brown rice chips or tortilla chips, or as a topping for tacos or fajitas. Ingredients: 1-2 cloves of garlic (based on preference), 1.5 cups of prepared chickpeas (or 14oz can if necessary), 5tbsp olive oil, 3tbsp lemon juice, freshly squeezed, 2tbsp tahini (optional), 1cup fresh spinach, Sea Salt (to taste). Directions: Place all the ingredients in a food processor or blender and blend until creamy and smooth. If you are having trouble blending, add more olive oil. Taste and modify if need be by adding more lemon juice, salt or olive oil. Directions: 1) Preheat to 350°F. Line 2 baking sheets with parchment paper or grease. 2) Whisk oats, whole-wheat flour, all-purpose flour, cinnamon, baking soda and salt in a medium bowl and set aside. 3) In a separate bowl, beat butter in with an electric mixer until blended into a paste. Add cane sugar; continue beating until well combined. Beat in egg, then vanilla. Stir in the oat mixture with a wooden spoon until just moistened. Stir in chocolate chips and walnuts. 4) With damp hands, roll 1 tablespoon of the batter into a ball, place it on a prepared baking sheet and flatten. Continue with the remaining batter, spacing the flattened balls 2 inches apart. 5) Bake the cookies until golden brown, about 16 minutes. Cool on the pans for 2 minutes, then transfer the cookies to a wire rack to cool completely. Ingredients: An assortment of fruit cut into bite sized cubes (melon, pineapple, strawberry, grapes, banana etc. ), Organic, probiotic yogurt, Granola. Directions: 1) Mash bananas and add butter, and sugar. Beat well until mixed. 2) Add egg, vanilla and beat again 3) Mix dry ingredients together in a separate bowl 4) Add wet mixture to dry mixture and mix well 5) Add berries and stir gently 6) Spoon the batter into the muffin pan, filling each cup to just below the rim 7) Bake the muffins for ~20 minutes at 350°F, or until a dry tooth-pick check. Topping Ingredients: 1 cup brown rice syrup, ½ cup of whole rolled oats (uncooked), ½ cup shredded coconut, ½ cup raisins and/or dried cranberries, ½ cup chopped almonds (raw preferably), ¼ cup sunflower seeds, ½ cup dark chocolate, 3 eggs, beaten, 1 tsp vanilla extract. Directions: 1) Preheat oven to 350° (F) 2) In a small bowl, use a fork to combine the crust ingredients and press the mixture into the bottom of a lightly oiled square or round baking dish. Bake for 15 minutes 3) Meanwhile, in a large bowl, combine all the topping ingredients and mix them well 4) Pour the mixture over the partially baked crust and bake for another 15-20 minutes 5) Allow it to cool completely before cutting into bars. Ingredients: 1 eggplant, cubed and baked, 1/4 cup lemon juice, 1/4 cup tahini (optional), 2 cloves garlic, minced, salt and pepper to taste, 1 1/2 tablespoons olive oil. Directions: Blend all ingredients together in blender or food processor. Ingredients: Whole wheat or corn tortillas, 1 tbsp mild salsa per tortilla, handful of grated cheese per tortilla. Directions: Assemble tortillas and place on a baking sheet. Bake 350°F until cheese is melted. Broil for 1 minute to finish. 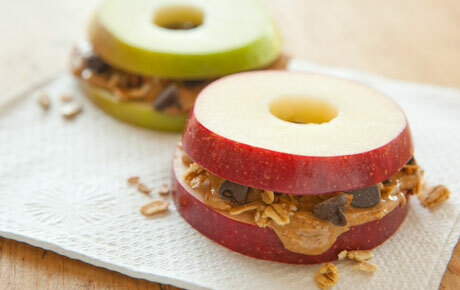 Ingredients: 1-2 apples cut into rings, nut or seed butter, dark chocolate chips, home-made granola.